In all walks of life there are divides, tensions, battles, opposition, and rivalries. Sport is no exception, all of the world’s biggest sports have intense derbies and rivalries. In Gymnastics, it’s the USA and China, in baseball, it’s the Yankees and the Red Sox, in Rugby Union, it’s Australia and New Zealand, but in football there is only one rivalry that everyone talks about. 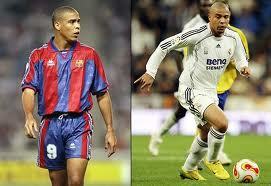 ‘El Clasico’ as it’s known, is the biggest rivalry in world football. 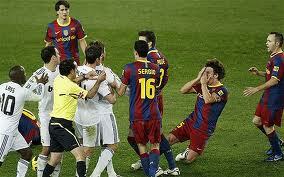 It is contested between Real Madrid and Barcelona, the two most successful teams in the history of Spanish football. ‘El Clasico’ or the Classic, was first played in 1902 between these two giants of the European game. All rivalries must start somewhere and more often than not it is an off field dispute that starts these tensions between clubs, causing these fierce rivalries. The rivalry between Barcelona and Real Madrid starts from the rivalry between the two cities they respectively hail from. Madrid is the capital of Spain and is very closely linked to the monarchy whilst Barcelona is the capital of Catalonia which wants independence from Spain. Real in Spanish means Royal and Real are the Royal club. ‘’Growing up in Cataluña, we were told of all the things that Franco and the Spanish did to us, how they took our money and our freedom, through football we have a non violent way of beating them’’ said 20 year old college student Aleix Hernandez. Although Franco supported Athletico, Real became the symbol of all things Spanish and although they had nothing to do with what Franco was doing they became extremely unpopular. As time progressed and politics in Spain became more influential in football, so too did the hatred between the two Clubs, Cities and Peoples. Politics became more influential as the different regions sided with different clubs. The Basque area with Athletic Bilbao, Catalonia with Barcelona, and Spanish nationalists with Real Madrid. As this evolved, so too did the hatred between the two Clubs, Cities and Peoples. When Franco was in power in Spain, from 1939 until his death in 1975, one of the orders that he gave to his troops was to kill Josep Sunyol, leader of left wing politics in Catalonia and President of Barcelona football club. Franco also abolished the fiscal privileges enjoyed by Catalonia, refused to recognise it as a separate region from Spain and also forbid any other language being taught in schools, except Spanish. When Franco insisted that these means were necessary and would be permanent, he angered and dismissed the people of Catalonia and everything they stood for and believed in, except of course for his supporters. By doing this, the people of Barcelona rebelled and got behind the local football club, which they saw as an identity and expression for Catalonia and the Catalan people, which they used to vent their hatred for Franco and Spain, they also set up a group called the ‘Boixos nois’ which were a left wing hooligan group used to attack Real fans and vandalise property in Madrid at away games. ‘’In Madrid we are similar to Belfast we love the monarchy and we love Spain, people in Cataluña seem annoyed by this but it is our Country and they live in it,” said Alfredo Juan Fran, a local waiter from Madrid. The term ‘Mes Que Un Club’ or more than a club, became Barcelona’s motto in the succeeding years and remains right up to the present day. In recent times, the fiscal rivalry has increased as Real’s players don’t pay near as much tax on their wages as their Barcelona counterparts who must pay a 50% tax, once again outraging Catalonians. This issue has been raised several times in the Spanish parliament but to no avail, Real are known as the Kings club and receive many privileges because of this. In the Spanish civil war, the republicans, whom Catalonia supported, fought the nationalists, whom the people of Madrid supported. The on-field rivalry has been driven by both off field events as well as the successes of both clubs on the field. Between the two clubs they have 53 out of 73 leagues and have 44 Spanish cups. ‘’When they win it is not good it is very sad, they are not nice people, they cause much trouble. We have a history here in Madrid, we have a stadium, trophies and the best players in the world they try to copy us and yet they still want freedom’’ said Alfredo Juan Fran. Politics has always played a major role in the Spanish Cataluña rivalry. Alfredo Juan Fran, a waiter in Madrid said ‘’you always know when Barcelona are in town, they bring much hatred with them and the atmosphere becomes very uneasy and you see a lot of police around the city, it is not nice when they are here’’. In 1997, the rivalry reached new heights when then vice-captain Luis Figo traded the Nou Camp for the Santiago Bernabeu, Figo’s transfer from Barca to Real sparked outcry in Spain and much rioting and vandalism occurred before, during, and after ‘El Clasico’. It was revealed in later years that money from the government helped to bring the Portuguese superstar to Madrid. The reason behind this is that if Real keep winning, more people will watch and go to Real games and so Madrid and the government get a dividend. On Figo’s return to Barcelona in 1998, during a Copa Del Rey match, a pig’s head was thrown at him by members of ‘Boixos nois’. The group cause a lot of trouble when they go to the capital, especially when they play Real. They have been known to start fires, damage and vandalise property, and cause general mayhem, both inside and outside of the Santiago Bernabeu. ‘’When I was a kid, my dad brought me to games every week and we would talk about the great football we would watch, but he would never take me to a Real game. He said it was too dangerous. Now I see for myself why it is too dangerous. I understand why Boxis Nois do what they do, they are like me, a Catalan, and we don’t like Spain or Real for what they have done to us,’’ said Barcelona native Aleix Hernandez. In 2009, Cristiano Ronaldo’s world record transfer to Real from Manchester United sparked more controversy as it was the Spanish government who forked out some of the €93.9m paid for the Portuguese Captain, as again they felt that having Ronaldo in the capital would indeed help attract people to Real matches giving them a dividend. This transfer showed how the Spanish authorities twice in twelve years publicly backed Real against all the other La Liga teams but particularly to halt Barcelona’s progress. ‘’Real bought Ronaldo because we have Messi, Kaka, because we have Xavi, and Alonso because we have Inesta. They want to be like us, but they can’t because ‘our players’ want to play for us, while their players just want money,” said Hernandez. ‘El Clasico’ has always boasted some of the biggest names in world football, with one club battling against the other to get the world’s best players. The likes of Maradona, Rivaldo, Ronaldinho, and Messi have all played for the Catalan giants with Di Stefano, Zidane, Raul, and Cristiano Ronaldo playing for los Blancos. The Real-Barca rivalry is the biggest watched club football match in the world with over 600 million people tuning in to watch ‘El Clasico’. ‘’I go to many Real games and I watch many Athletico (Madrid’s city rivals) games but never Barcelona’s. They annoy me and are always flying flags about Cataluña and freedom. Bilbao, a team from the Basque region of Northern Spain and Southern France) fly similar flags, but they never say sorry for all their bombs, ETA, and attacks that have killed so many innocent people,” said Alfredo Juan Fran. Since their first meeting in 1902, The Clubs have met on 433 occasions. Barca hold the upper hand with 205 victories, with Madrid on 186, and they’ve played out 42 draws. Although the Catalan giants have enjoyed 19 more victories than Real, it is the latter who have all the bragging rights, having won 11 more leagues than Barca, and also holding the record number of European cups, nine, with Barca back in joint fourth, and Bayern Munich with four. Real can also boast more Club world cups than their fiercest rivals winning that battle three to two, The Kings club have far greater fan numbers in both Asia and South America although Barcelona have much larger followers in Europe and indeed in Spain. Barca’s motto may be ‘Mes Que Un Club’ but this unique fixture in world football should acquire the motto ‘Mes Que Un Derby’.